If you’re just joining me, I’m spending the next few days doing a 12 Days of Self Care countdown to the holidays. Today’s topic is one piece of the self care puzzle that many don’t think about – finances and saving money. For me, I find that a good bargain or a little extra money in the bank can do wonders for my mood. This makes it a piece of self care in my book. 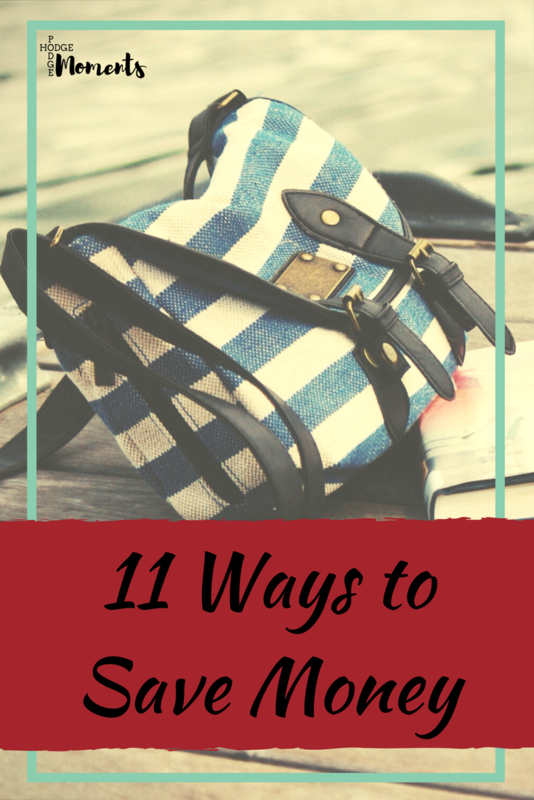 So, today, I’m bringing you eleven easy ways to save money. Growing up, we were given a weekly allowance and had to make our dollar stretch to do the things we wanted to do. It didn’t take long before I learned how to make a small amount of money go a long way. This is a skill I’ve carried into adulthood and still amaze my husband with it. Today, I thought I’d share a few tricks I’ve learned over the years. If you’ve looked into saving money, then you’ve probably seen the term “budget.” It’s a term that’s often associate with having no fun. I’m a big believe in making sure that you budget in a little spending money so that you can still have some flexibility and fun without breaking the budget. Pay yourself a weekly allowance. There was a time a couple of years ago where I decided that I needed to limit my weekly spending. I decided what items would come from the budget and then paid myself an allowance in cash each week. Anything extra had to come from this allowance. Use cash instead of a debit card. For me, I find that I think twice before I hand over a little cash for something. The same thought isn’t always made when I’m using my debit card because I’m not seeing the money in front of me. For this reason, there are times when I use cash as my primary means of payment. Take time to plan out your meals. This is a big money saver for us. When we do a good job of meal planning and make a grocery list to go along with it, then we spend a lot less at the store. If we go to the store without a plan, then we buy things that we don’t necessarily need. Food and money gets wasted this way. I could give you the money comparisons on this one, but let’s just keep it simple and say that eating at home is typically cheaper than a meal out. Since moving to Michigan, we eat at home most of the time and it’s a huge money saver. Make use of a car pool system. For most people, a lot of money is burned in their car’s gas tank. Gas isn’t getting any cheaper, which means this expense is only getting bigger. You can cut down on this expense by finding other means of transportation including public options and car pools. I also recommend grouping your errands together so that you’re not making multiple trips out each week. A lot of money can be saved by simply thinking through our choices. This one is a simple and self explanatory tip. Take a few moments before you say yes to something and consider just how much it’s going to cost you in the long run. 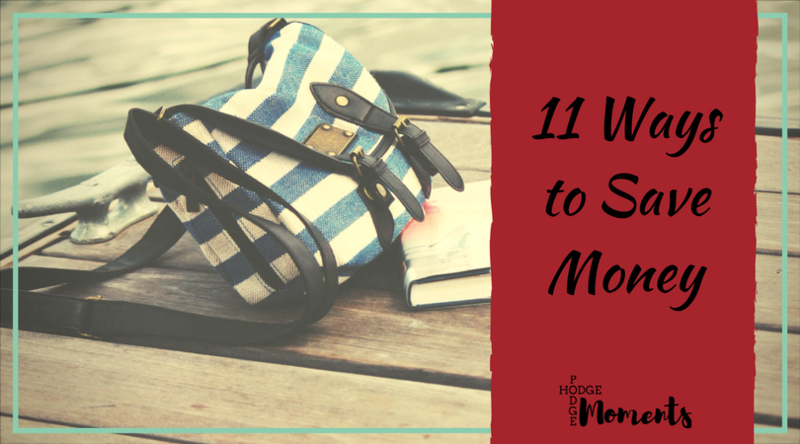 Each month, put a little bit aside in savings for those unexpected things that come up. Even a small amount each month can add up and help you out in the future. After all, unexpected things are never planned! I remember listening to a financial advisor that was on a talk show while I was in high school. One of her biggest tips for saving money was to look at the little things you do regularly, like buying a cup of coffee every day. These are the small things that add up over time and can actually be quite costly in the end. Finding alternatives to these items can help you save more than you might think. Order water when you eat out. Remember when I talked about those small things that can add up? Have you ever gotten your bill at a restaurant and wondered how it got so high? Your drink order is often the culprit. Many restaurants charge two or three dollars per drink. This can add up quickly, especially if you have more than one person at your table. Order water instead and save a few bucks here and there. Remember, those small savings add up over time to become big savings. Be frugal and smart with your shopping. There are so many different ways to save when you’re out shopping. My favorite is to visit the clearance racks, especially when I’m shopping for clothes. I’ll buy something that’s slightly last season in order to save money in the long run. Another great way to save money is by checking out the sales and using coupons and discounts when possible. There you go – a few of the things I’ve tested out with success over the years. I don’t recommend trying to do all of these at once. Instead, read through them and pick out the ones that could work for you. And most importantly, remember that little savings can add up to be big savings in the long run. Do you have a favorite money saving tip? I’d love to hear about it in the comments below!